Don’t like shrimp? Replace the shrimp with chicken or tofu. Don’t eat shrimp, chicken, or tofu? 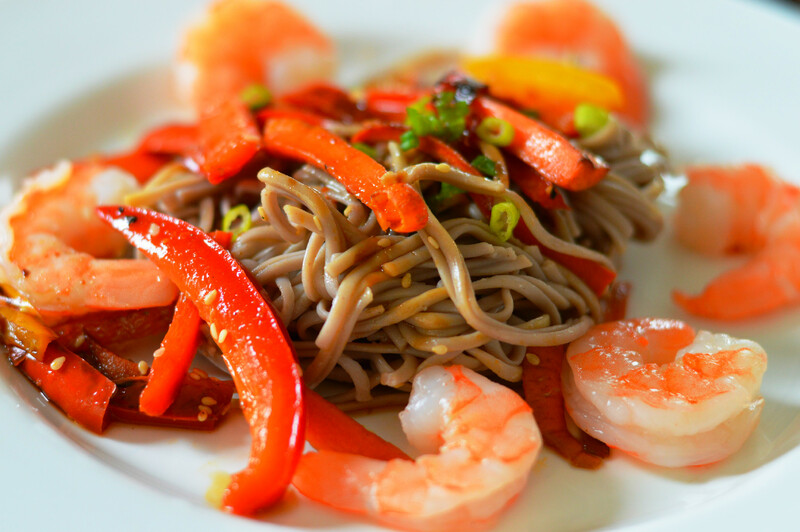 Leave them all out of the recipe, these Sweet and Spicy King Soba Noodles are delicious on their own. Besides cooking the shrimp, this recipe is so quick and simple. It also makes four days worth of dinners (or two days worth if you are sharing the recipe with your significant other). In a large saucepan, bring water to a boil and then add noodles. Cook the noodles for 5 minutes. Drain, rinse, and set aside. In a small bowl or container, combine maple syrup, sesame oil, coconut aminos, rice vinegar, ginger, and red pepper flakes together. Heat a frying pan over medium heat. Add red pepper, carrot, chives and half of the liquid to the frying pan. Cook the veggies until tender and then remove from heat. Combine noodles, veggies, grilled shrimp, and the rest of the liquid in a large bowl. Top with sesame seeds. *According to the IBS Diets FODMAP chart, chives are considered low FODMAP even though garlic and onions are banned. Use your own judgement if you are following a low FODMAP diet.